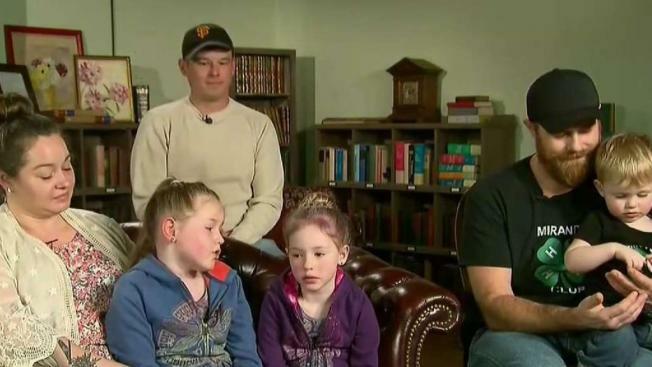 They wanted some adventure, but two little girls who wandered away from their Northern California home on Friday got a lot more than they bargained for over the next 44 hours. Still, they looked out for each other and survived a long, cold, wet ordeal in the wilderness, they said in an interview Monday after they were rescued in a massive search effort. "My sister cried the whole night, so I told her to think happy thoughts of our family and I kept watch for most of the night," said Leia Carrico, 8. Leia and 5-year-old Caroline had asked their mother if they could go for a walk on Friday afternoon. Misty Carrico said no, but when she wasn't looking, the girls set off into the wilderness outside their home in Benbow, near the Pacific coast about 200 miles north of San Francisco. "Leia wanted a little tiny more adventure, but I wanted more," Caroline explained Monday. When it started raining, they found shelter under a tree branch and huddled together under Caroline's rain jacket to keep warm. The girls stayed put, drinking water that collected huckleberry leaves, they later told rescuers, though Leia added in the interview that "our bellies grumbled the whole night." But Leia was armed with some outdoor survival training she learned in a 4-H youth development club, camping with their family and from watching "Lost." They tried making a fire and sang nursery rhymes at a nearby creek. "I felt a little nervous and a little afraid but I knew Dad would find us," she said. They had also left clues that would help the more than 250 search-and-rescue personnel scouring the area by land and air find them: granola bar wrappers and their footprints. Misty Carrico feared the worst as night turned to day and back again — the area has steep terrain and mountain lions. Twelve years ago, a 70-year-old man survived an attack by a mountain lion in a state park at the opposite end of the county. Armed with some outdoor survival training, granola bars and pink rubber boots, 5- and 8-year-old sisters survived 44 hours in rugged Northern California wilderness before they were found dehydrated and cold but in good spirits on Sunday, authorities said. Marianne Favro reports. But on Sunday morning, two members of the Piercy Volunteer Fire Department found the girls' trail and, two hours later, discovered them 1.4 miles away from their home. They were OK — the Humboldt County sheriff would call it "an absolute miracle" given the rugged environment. Video of their reunion with their parents shows them being whisked out of the woods on all-terrain vehicles one after the other and into their family's arms. "I was so happy that I hugged daddy and mommy so tight," Caroline said. Naturally, the parents are overjoyed to have their girls back. "They did the right thing," Misty Carrico said. "I mean, they might have wandered off but they stuck together and they pulled themselves through. They saved each other." She added, "I'm the proudest mom. I raised superheroes." Humboldt County Sheriff William Honsal goes in depth to describe how two young sisters managed to survive in the wilderness for 44 hours.